Wine-red, Italian chicory. Its bitter taste is a great contrast to rich or fatty flavours such as gorgonzola and walnuts. An Italian favourite with bright red leaves that lends a sophisticated touch to most dishes. 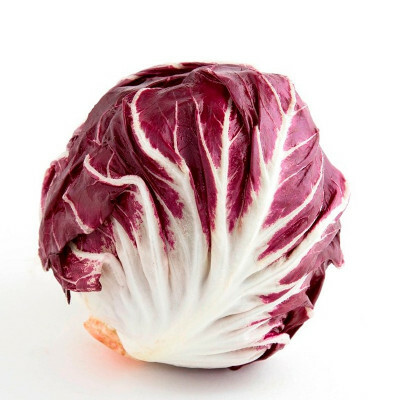 Distinguished by its compact spherical shape and white veins along the centre that are similar to those of a rose, Radicchio di Chioggia gets its name from the famous place it hails from: the lovely lagoon city of Chioggia. Cooking Radicchio brings out the vegetable's natural sweetness but it can also be served fresh. It can be chopped and sautéed or halved and grilled. Fresh leaves are sturdy enough to be used whole as a cup or wrap. In Italy Radicchio is classically added to risottos and tomato sauces or simply grilled and dressed in olive oil. The bitter flavour pairs well with sweet, sour, fatty and salty accompaniments such as citrus, pear, pomegranate, tomato, balsamic vinegar, walnuts, anchovies, cream based dressings and sauces, candied pecans, salted meats such as bacon and salami, black pepper and provolone, parmesan and gorgonzola cheeses.